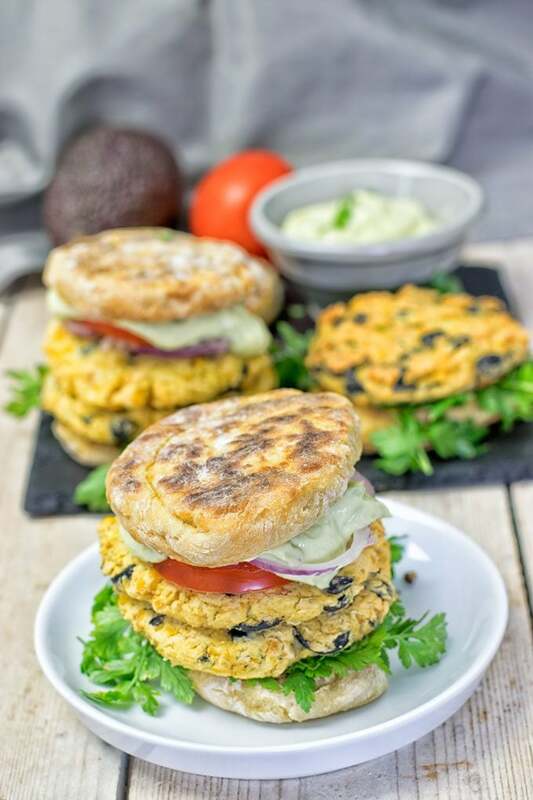 Mediterranean Vegan Burger – patties with chickpeas and black olives, combined with an Avocado Hummus Sauce. Only 6 ingredients and 3 easy steps and this new staple in your house will blow you away. I have a thing for Vegan Burger Recipes and I know you all are into my burgers. It’s no secret that my Vegan Lentil Burger is the top recipe on Contentedness Cooking so it was only a matter of time until I got back to the burger roots. You may say “burger is burger”. You make a patty, a sauce, and then you top this with some onions, tomatoes or whatever it is you like or have on hand. 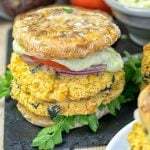 But this Mediterranean Vegan Burger is a special flavor wonder and taste dream – it has all what it takes to complete a burger and you are going to build the burger of your dreams. I’m a summer guy. Do you have a favorite season? I really like the nature and with summer vibes going high, I recently took a bike tour with friends. 3 hours tour one way from my city to a city called Den Bosch. City stroll, a coffee in a small cafe, and back 3 hours. Turns out, this burger is also a perfectly portable food to enjoy the summer, for example on such a bike tour, or an outdoors picnic. If you want and need something quick to grab, here we go. Of course, you have the options to combine the basic recipe with your favorite toppings – or to enjoy them as they are. I think you will soon get addicted to this Mediterranean Vegan Burger. Because you will just love this that they are perfectly flavorful, Mediterranean inspired, tasty, mouthwatering, drool worthy, easy and so delicious. Are you excited? 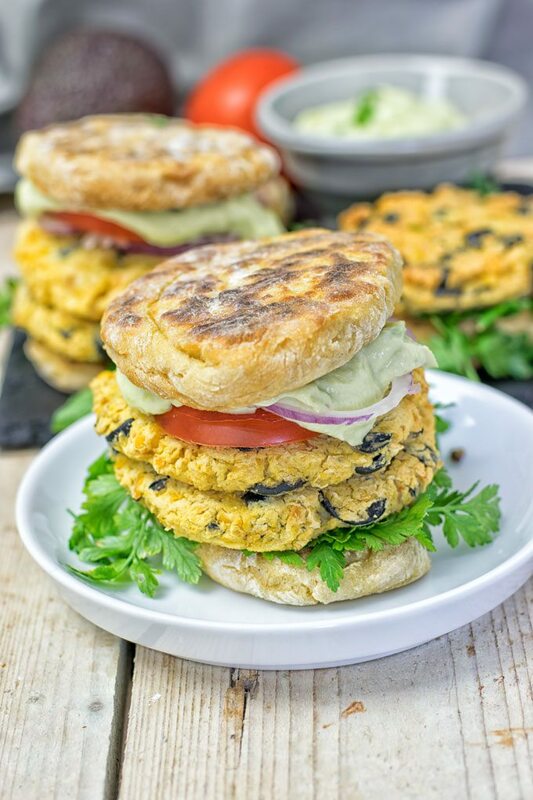 Let me show you how to make my Mediterranean Vegan Burger, shall I? Let’s start and find a blender. Make the Avocado Hummus Sauce simply by combine hummus, garlic, almond yoghurt, and avocado. Season with salt and pepper, process until smooth. For the patties, it’s blender time round 2. Combine garlic, 2 Tbs of the Avocado Hummus Sauce, chickpeas. Season with salt and pepper, and again process until smooth. But leave some texture, it does not have to be creamy! Now mix in chopped olives, form patties, and fry or bake for around 20 minutes at 390°F, done. Assembling is easy: use your favorite bun (choose gluten free if you need). For myself, I used my Roasted Garlic Naan to make my own gluten free buns for the burger. Top the burger with your favorites: onions, tomatoes, and more. Dream big, friends! Create your own burger dreams and make them happen. Enjoy! 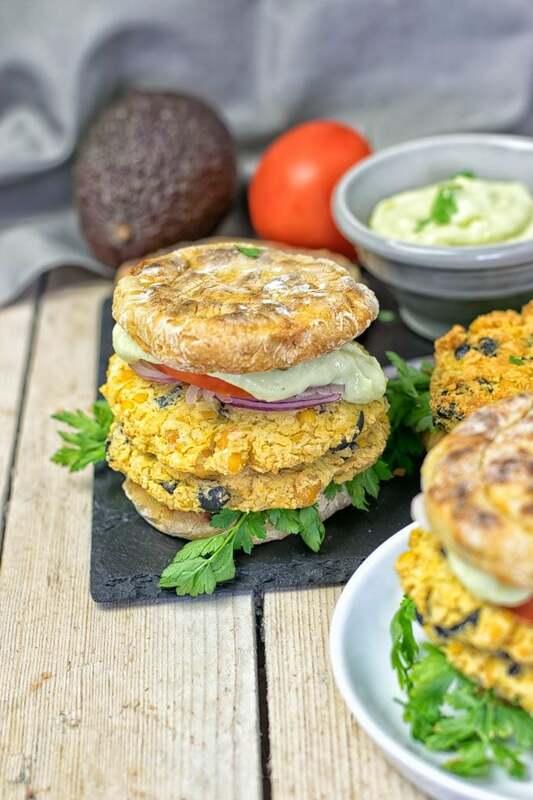 Friends, did you already know this Mediterranean Vegan Burger is not only delicious, full of flavor – it’s also incredibly healthy and a good bite. One of the main ingredients of my burger are black olives. They are rich in vitamin E – with just one cup of black olives you get 20% of your daily intake in vitamin E.
Also it’s full of good fat, has anti-inflammatory benefits. These little wonders are meant to be fantastic for you. Curious about more? Then read this great overview “Health Benefit of Black Olives“. Friends, are you in the mood for a bike tour, or summer adventure? You came to the right place! Make these, give them a try. As always let me know! Give me a tag on Facebook or Instagram. Snap a picture, I’m happy to be a part of it. See you soon! Cheers, Florian. Simply by combine hummus, garlic, almond yoghurt, and avocado. Season with salt and pepper, process until smooth. Combine garlic, 2 Tbs of the Avocado Hummus Sauce, chickpeas in the bowl of a blender or food processor. Season with salt and pepper, and process until smooth but not creamy! Now mix in chopped olives, form patties, and fry or bake for around 20 minutes at 390°F. Use your favorite bun and top the burger with the Avocado Hummus Sauce and your favorite toppings. Your burger looks incredibly easy to make and I love the avocado hummus that goes with it. Just fabulous! 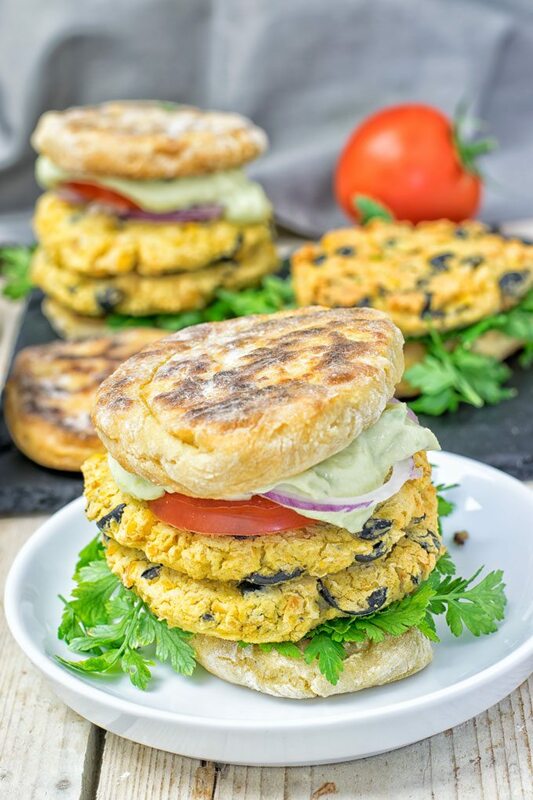 Love, love making homemade veggie burgers, or in this case, chickpea burgers! Endless possibilities to add flavors so they taste amazing. I love that you added olives here, olives are one of my favorite foods. And avocado hummus is one of my favorite hummus recipes, so I’m loving this sauce version. I bet it has a wonderful tang, thanks to the yogurt. What a wonderful and simple recipe Florian! I would be drowning my burger in that sauce, haha! Simple yet good flavor in this burger. The olives give a real salty twist to this burger. Love the combination of chick peas and olives. I haven’t started experimenting with veggie burgers, but when I do, I’ll have to start with a variation on this one. Let me know if you give them a try, Laura! Awesome love the wonderful combination. Awesome and thanks so much for your wonderful feedback! Can’t get yoghurt here for uNader five euros per small carton except for some grey, watery soy. I have found…. a wondrous hemp tazaki recipe on pininterst, no yoghurt at all and I wondered if it would be good in these, so much is off limits as I have to add yoghurt. Also, I can see you are busy with that wild imagination and being going more delicious goodies but… have you thought to turn your thoughts to alternatives to yoghurt for savoury and sweet items as it just puts those out of my reach. Doing some very happy munching from here florian! Hi! I see your frustration, not having access to a good plant based yoghurt. You can make your own yoghurt from cashews or other nuts. Let me know what you think. Thank you, now do you have any tips you can recommend? I do enjoy kitchen time and experimenting that one day a week fir me to let rip! Try another non dairy yoghurt than you can get. Everything will work here, maybe soy, almond, oat! Great news, got a new coconut yoghurt in health shop. Mine in order each week. I am having g a good time searching out the recipes I had to discard so my spare time giving our menu a lot more to rotate!